Jump Start Sports baseball and softball programs are typically structured as instructional leagues. Each weekly session will include age appropriate skill stations and a game. The “league” format enable coaches to teach team concepts and teamwork. Authentic MLB caps and team tees help get children excited about playing. Instruction is age appropriate, but our coaches are trained to teach children with a wide range of ability. Parents are encouraged to assist in the program in any way they so choose, but the programs are run by trained Jump Start Sports staff coaches. T-Birds T-Ball is an introductory T-Ball program for 3 and 4 year old boys and girls. Major League Coach Pitch Baseball is a traditional “coach pitch” baseball program for 7 - 9 year olds that also introduces players to hitting a ball pitched by another player and pitching. Situational fielding and base running are further developed. 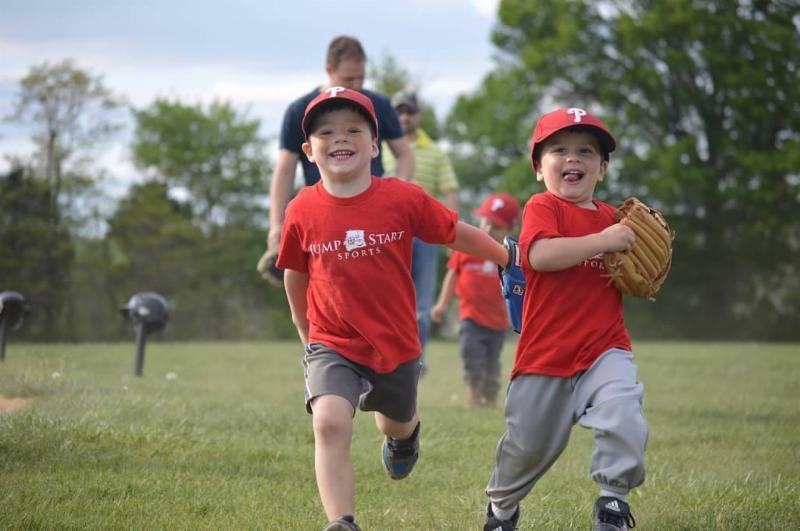 Rookie League Baseball introduces 5 and 6 year old boys and girls to hitting a pitched baseball (by a coach) as well as basic situational fielding and base running. Jump Start Sports Day with the Cleveland Indians!